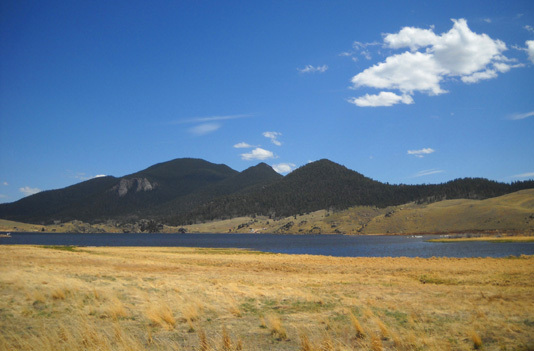 is the prime attraction of 1,105,704-acre Pike National Forest . 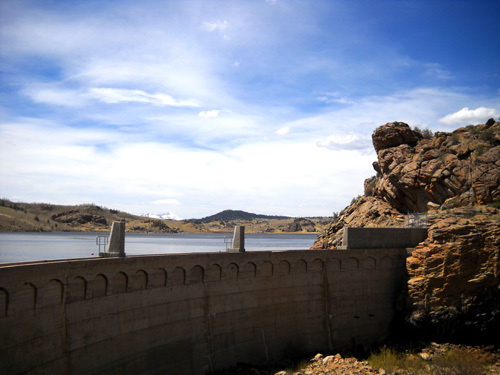 . .
and ample opportunities for fishing, hunting, hiking, and winter sports." There are so many national forests in Colorado that it's hard for me to tell on my AAA map where one ends and the next one begins. 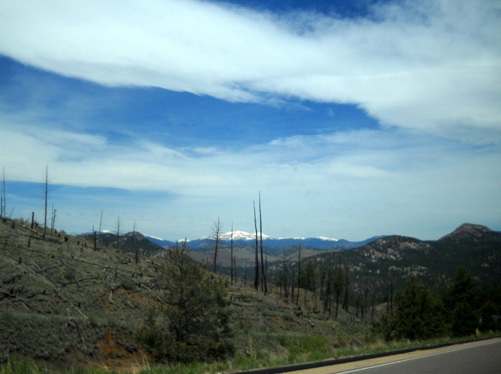 I do know that the large loop (lollipop) we drove today included a good portion of the Pike National Forest, however. We covered 210 miles, including some extra distance to check out forest service dispersed (free) camping options. 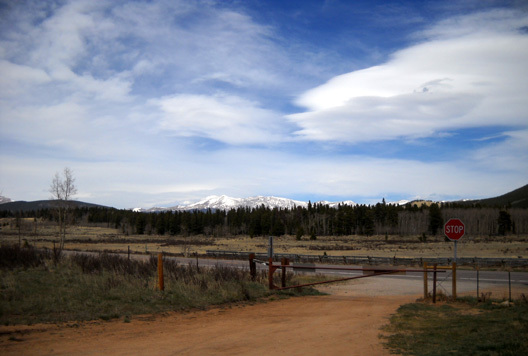 We saw some very beautiful territory along the way, including great views of Pike's Peak, Mt. 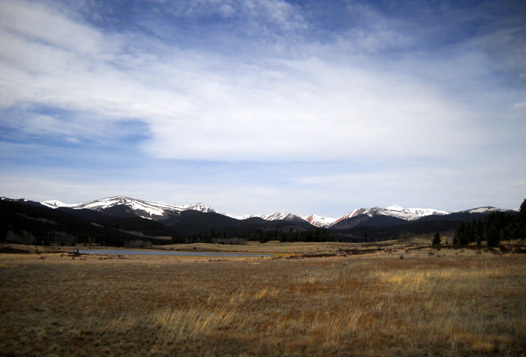 Evans, the Continental Divide, and the Lost Creek Wilderness Area. 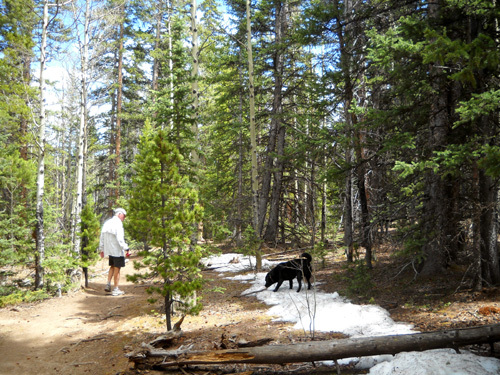 We saw snow above 11,000 feet but remained toasty warm at 6,000-10,000+ feet in the bright sunshine. 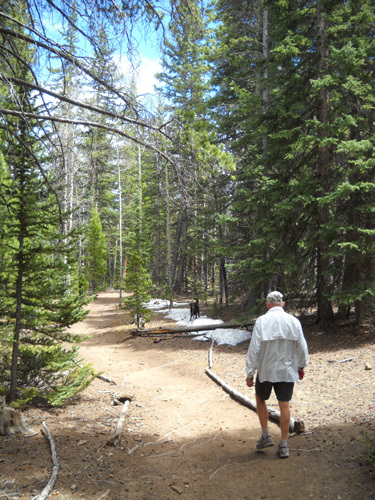 We traveled on some roads that were new to us and held some surprises, and we hiked a familiar section of the Colorado Trail from Kenosha Pass. We had fun! 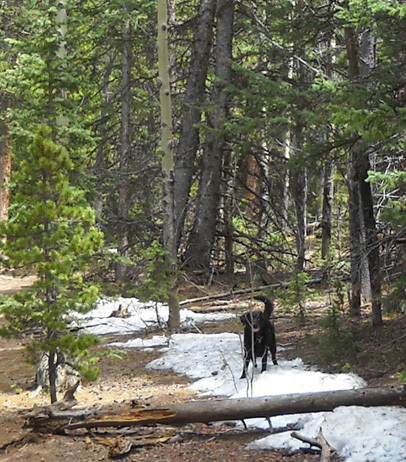 So did Cody -- we found him some snow banks and creeks to play in. I'll describe various parts of our journey and include lots of photos. Most of the roads were in great shape, suitable for any vehicle (including RVs). This route makes an interesting day trip or can easily be extended if you camp or find other lodging. 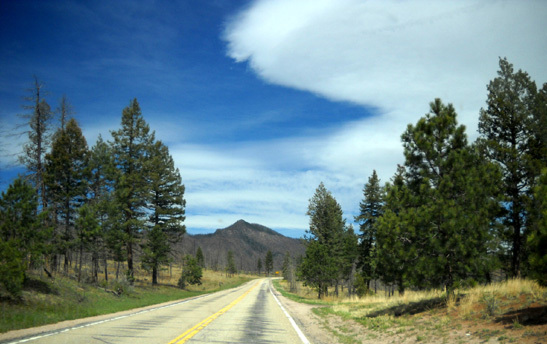 There are many other things to do in the national forest and towns along the way than what I'll mention here; we barely scratched the surface. One of the deciding factors in whether he enters the race is how close we can find a suitable camping spot. The only one we know of for sure is at Kenosha Pass, a 45-minute drive on race morning. 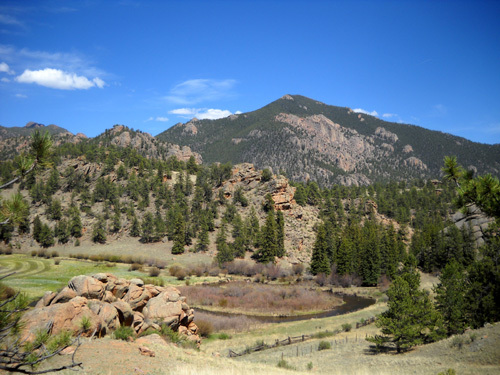 We wanted to look for closer spots along a forest service road (Buffalo Creek) we searched when I was doing the Colorado Trail in 2006. We know there are dispersed camping spots there but we don't remember how big they are or how rough the dirt road is. 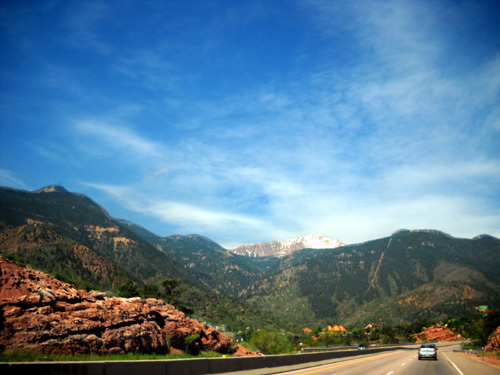 We began and ended our little excursion at the USAF Academy in northwest Colorado Springs, took I-25 and US 24 through Manitou Springs to reach the loop, and drove the loop part of the route in the counter-clockwise direction. The dotted lines on the map indicate what AAA designates as "scenic roads." 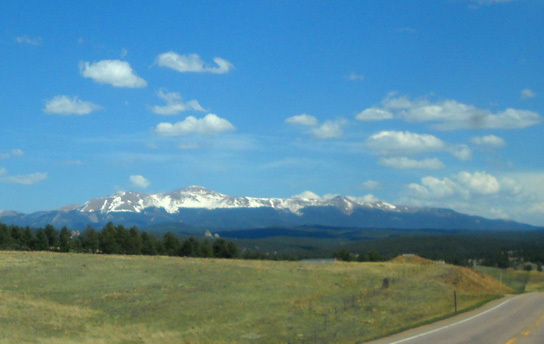 I can tell you that just about every road in Colorado west of I-25 is scenic! That's certainly the case with this route. The roads without dots were just as beautiful as the dotted ones. The first segment was easy to figure out: the most direct route from Colorado Springs to the race venue, without driving 4WD dirt roads over the Front Range, was to take four-lane Hwy. 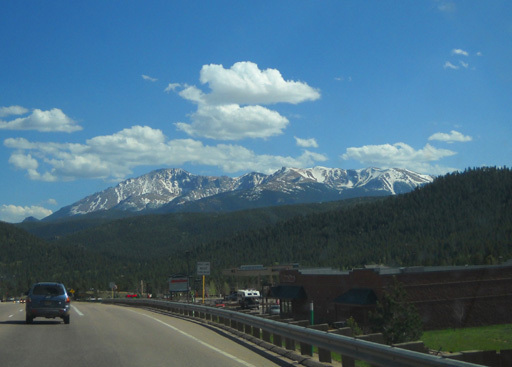 24 through the Pike's Peak/Manitou Springs area to Woodland Park, then head north on CO 67 to Deckers and CO 126 to Buffalo Creek and Pine Grove. 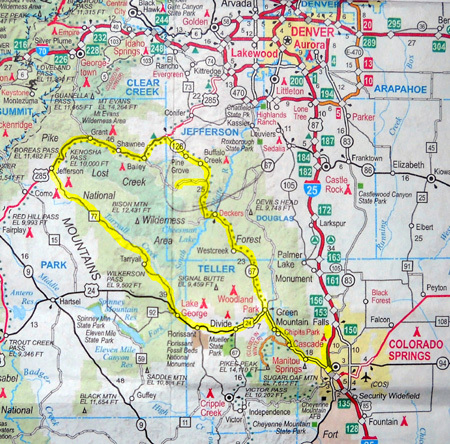 The forest service road we searched, CR550, is the little segment I marked in yellow that goes west off CO 126 below Buffalo Creek. Four-lane Hwy. 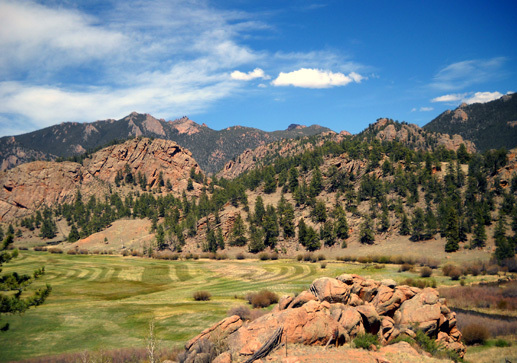 24 is scenic as it winds its way west from Manitou Springs higher and higher through rocky, hilly terrain. 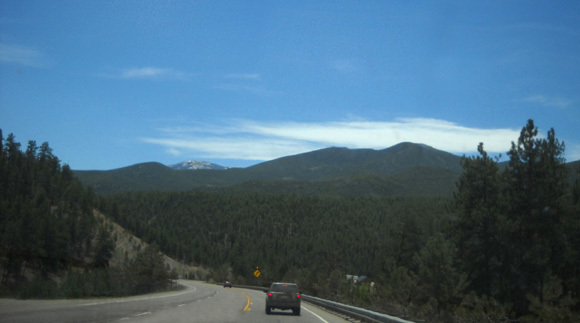 After the turn-off to Pike's Peak, the road is straighter and faster to Woodland Park, where we turned right on CO 67. We were pleasantly surprised by how good a road CO 67 is. Because it's marked "scenic," we thought it might be narrow and slow through the national forest. It wasn't. 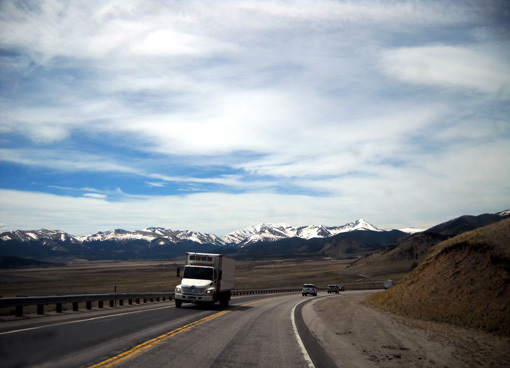 It's a good road for RVs as long as you watch for a couple of bumpy places. We noticed a nice paved bike trail along this road for about eight miles. I think it's called Manitou Park. 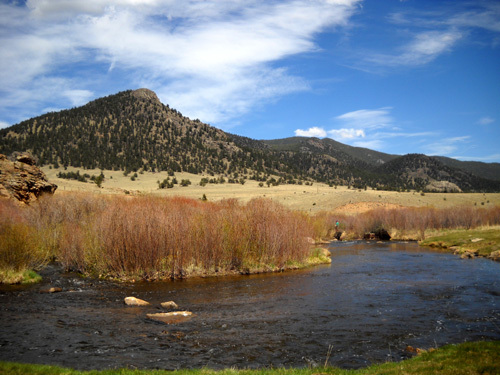 Near the little town of Deckers we crossed the N. Platte River and turned west, then north, on CO 126. This is also a good paved road that continues winding through the mountains. 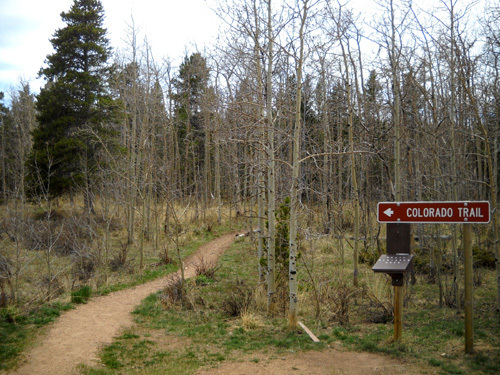 In a few miles we recognized the turn-off for CR 550, a dirt road that leads to the Little Scraggy trailhead between Segments 2 and 3 of the Colorado Trail. 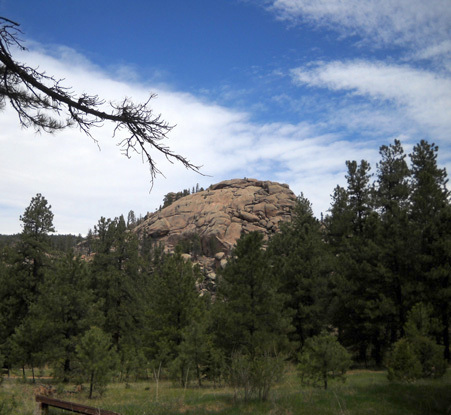 We drove through the day-use area to see the trailhead for nostalgia's sake, then headed west on CR 550 for three or four miles to check out the dispersed camping options along the roadway. With the Memorial Day weekend approaching, quite a few folks were already occupying the dispersed campsites. We quickly decided we'd never take the Cameo back this road, however. Although it looks nice and smooth in the next photo, it soon deteriorates into bumps and ruts. Four years ago we decided not to take the HitchHiker back there, either, but we couldn't remember exactly why. Now we know. There are lots of nice, free camping spots along this road if you have a tent or a small camper, particularly a truck camper, pop-up, or little Class B or C recreational vehicle, but we'd never drive a nice Class A or tow a new or medium-to-large travel trailer or fiver back there. Besides the bumpy road, the sites are mostly too small. Ditto with the paid Buffalo Creek forest service campground about three miles back this road. It was still closed today but opens tomorrow. We parked outside the locked gate and walked around the loop. The bathroom was open and the campground host's 5th-wheel camper was parked in there but none of the sites are large enough for anything over about twenty feet long. The campground road is also badly rutted -- really badly eroded. Well, darn. Camping along that road would be very handy for the North Fork race but it's not an option for us. 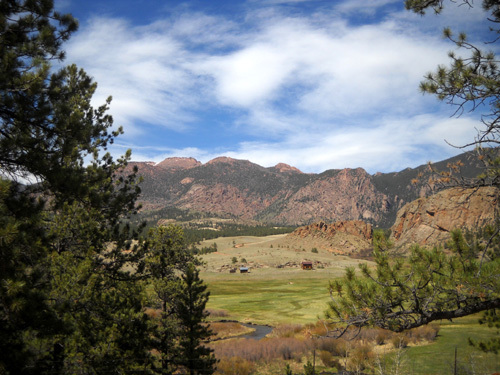 We did enjoy the scenery, however, and crossing the Colorado Trail a couple times on CR 550 and once near the firehouse on CO 126 farther up the road toward Buffalo Creek. We also found the start/finish for the North Fork race in Pine. 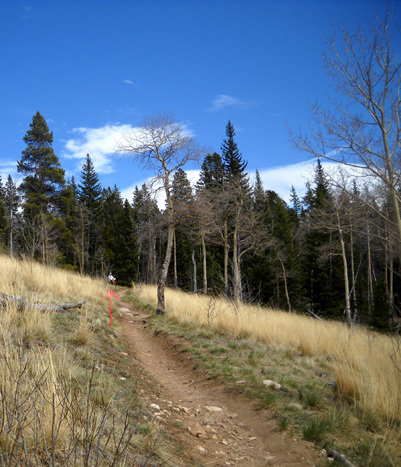 It's a pretty area and should be nice for the 50K and 50-mile races, although part of the course goes through a burn area. 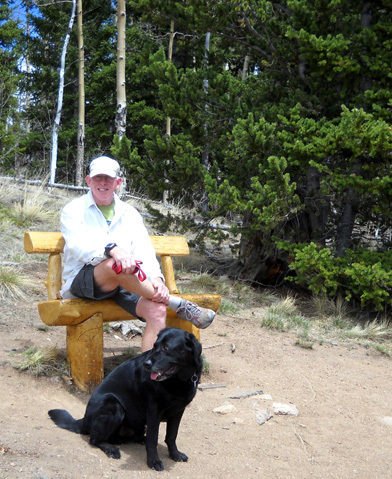 Jim wants to wait until after his next two 50Ks to decide whether to run North Fork or not. Our plan today was to see whether any of the campsites near Buffalo Creek were appropriate for us and to find the nearby race start/finish. If we found suitable sites, we'd just retrace our route back to Colorado Springs. If not, we'd continue on to Kenosha Pass, hike part of the CT, and either retrace our route from there or check out a road that's totally unfamiliar to us, CO 77, which would take us back to US 24. As you can see from the map above, that's the route we took. 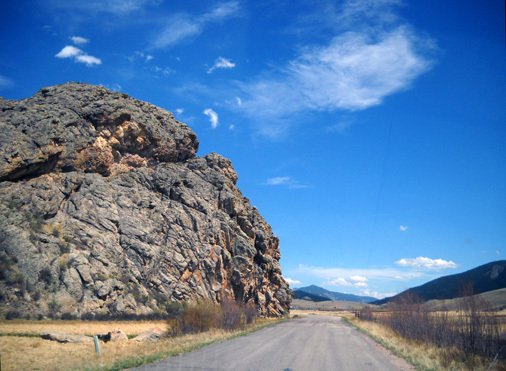 US 285 is a great road southwest from Denver to Buena Vista and on south to the New Mexico border. The part we drove today from Pine to Jefferson, about 25 miles, is marked scenic for good reason. 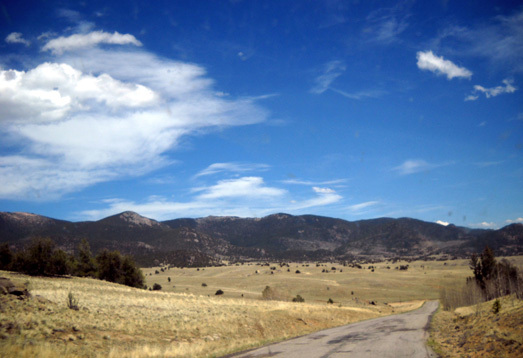 There are great views of mountains and valleys the whole way, with the Mt. 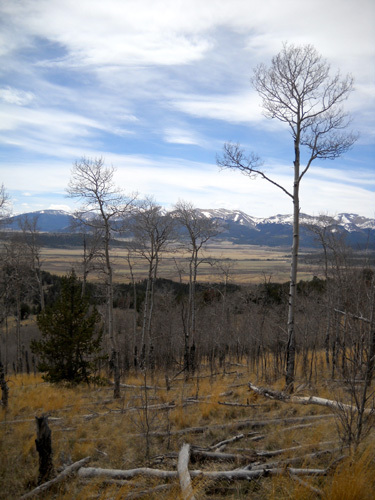 Evans Wilderness Area to the north and the Lost Creek Wilderness Area to the south -- both in the Pike National Forest. The highway is wide, smooth two-lane with passing lanes and other opportunities to pass slower vehicles like RVs. That's good, because we gained about three thousand feet climbing from Pine to Kenosha Pass, which is at 10,000 feet elevation. We have camped at Kenosha Pass in a national forest service campground on the south side of US 285 two or three times previously so we knew it was an option, albeit a distant one, for the North Fork race. No one was camped there today but it was open and several vehicles were parked there to access the Colorado Trail. Out of about a dozen sites, only a couple are large enough for our rig. It's first-come, first-served, so we'll have to trust our luck getting a site there if Jim enters the North Fork race. There is another forest service campground on the north side of the road. 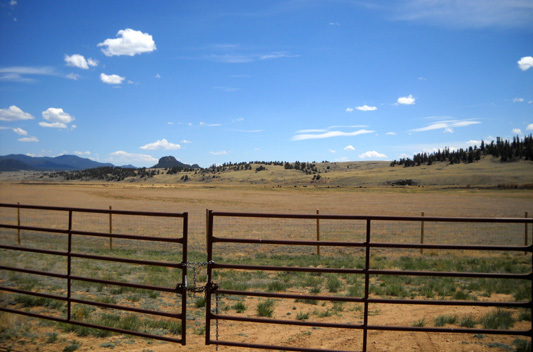 It was gated (below) but we could access the entrance road to reach the Colorado Trail on that side of the road. We've walked around that campground before and know it's not suitable for our rig. The loop is too tight, the trees are too close to the road, and the sites are too small. After checking out the campground we parked in the trailhead parking area on the north side of 285 and headed west on CT Segment 6 for about a mile. 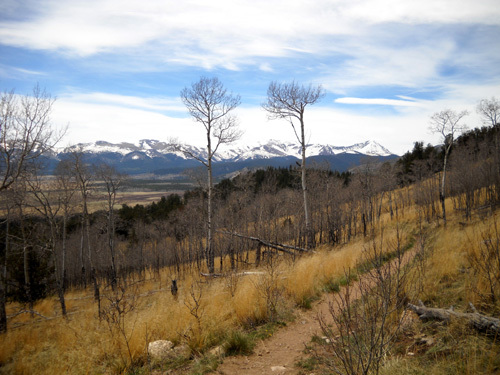 The trail winds up a couple hundred feet in elevation through aspens and pines to a bench with a view. 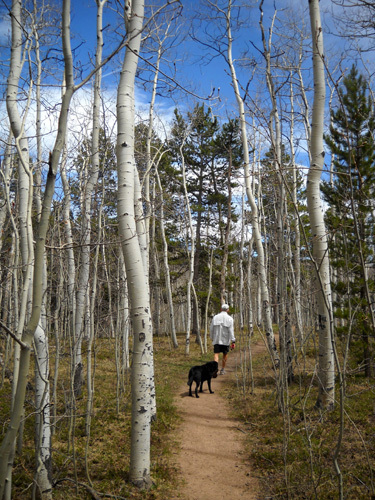 There aren't any leaves out yet on the aspen trees. The only flowers we saw blooming were dandelions (yep, we're in another Dandelion Time Warp again this year!). 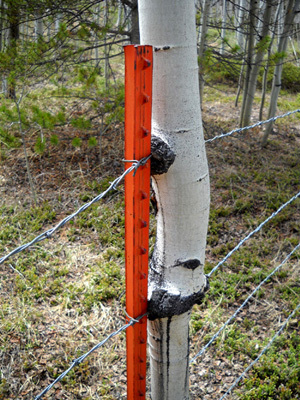 In case it's not obvious, the aspen tree has grown around all of the fence wires. 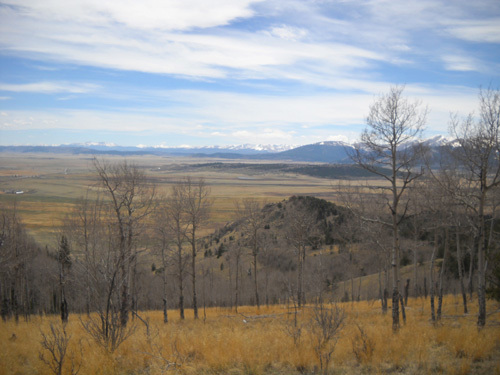 Most of the snow was melted here at just over 10,000 feet. Cody ran through or rolled around every snowdrift we passed. 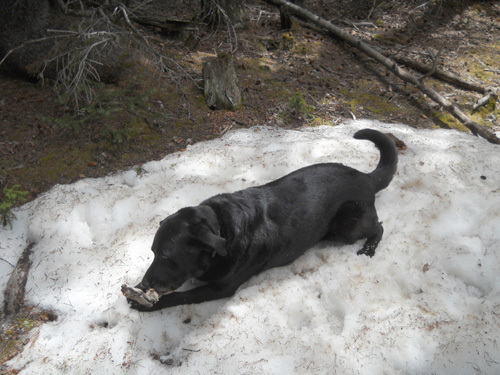 Here he is in double doggie paradise -- soft snow to lie in and a stick to chew! This is one of my favorite segments of the Colorado Trail, crossing the Continental Divide at Georgia Pass about twelve miles west of Kenosha Pass. Since I'm no longer able to run, I'll probably never do the entire 33-mile-long segment again (certainly not point-to-point) but someday I'd like to do an out-and-back hike from Kenosha to Georgia Pass. The views from Georgia Pass are magnificent. 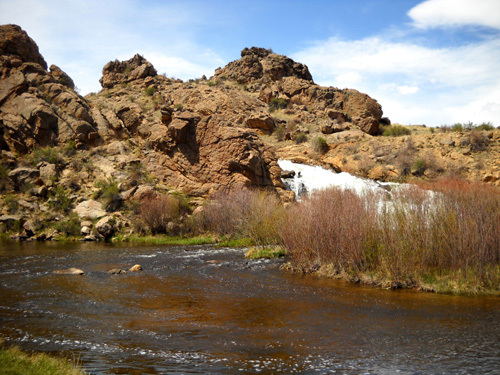 An interesting side trip in this area is to take Lost Park Road (FSR 56) south from US 285 to the trailhead between CT Segments 5 and 6 at Long Gulch. It's a fairly primitive road but 4WD isn't required as long as it's dry. We used that trailhead twice when we ran the CT but didn't go down that road today. Instead, we drove a few miles farther west on 285 to the little town of Jefferson and headed south on CO 77 for forty-two miles to the slightly larger town of Lake George. I love to explore new roads and trails. This was our first time on CO 77 -- and perhaps our last! Despite the lousy road maintenance, this is a very scenic road and I'm glad we took it. I'd recommend it if you're in a vehicle with good suspension and not in a hurry to get from Point A to Point B. 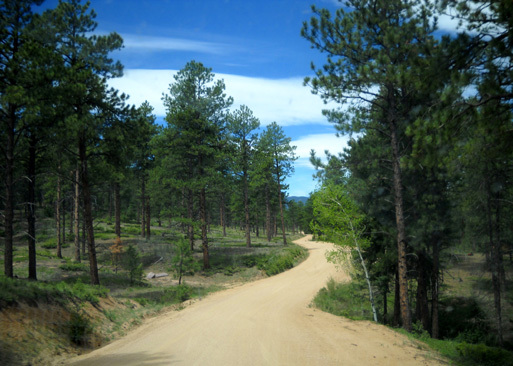 All but the first few miles at the north end of CO 77 are through the Pike National Forest. 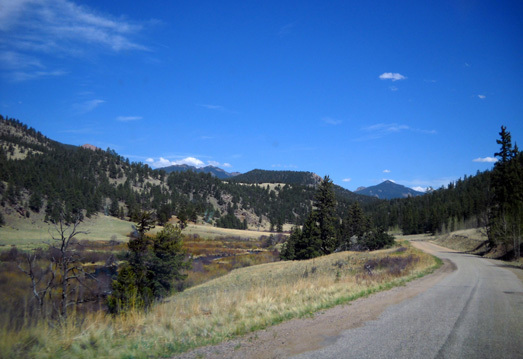 The road follows Tarryall Creek much of the way through a beautiful valley, close to the hills/mountains east in the Lost Creek Wilderness and with views of the Continental Divide to the west. 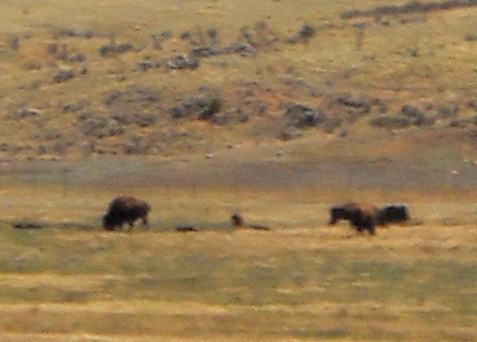 They're fuzzy, but "clearly" bison! 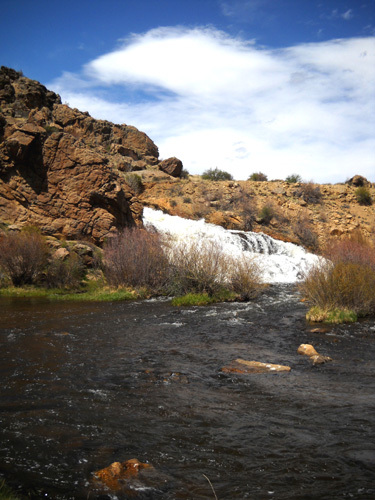 The shallow water was a good place for Cody to get a drink and swim around without bothering two anglers who were fishing a little farther downstream. This looks like a nice place to chill out, do some fishing and hiking, and get away from the rat race. I don't know if there is a fee for camping. Signs at an overlook above this scenic, fertile valley describe life here in the last 150 years. 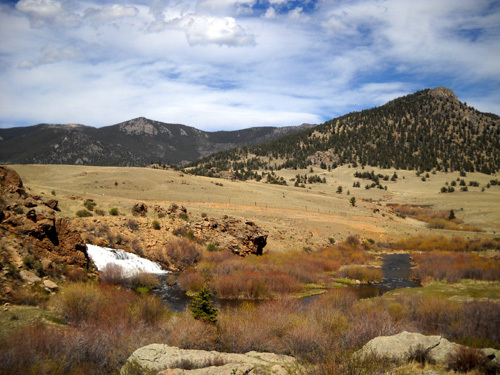 The mountains in the background, part of the Lost Creek Wilderness area, are one of eleven designated Natural National Landmarks in Colorado. One of the signs describes this scenic area as "a vast expanse of granite spires, pinnacles, narrow ridges, and deep gorges." 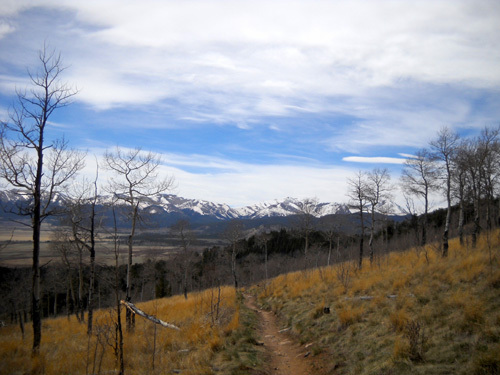 There are at least two trails through the Lost Creek Wilderness Area: part of Segment 5 of the Colorado Trail and the McCurdy Trail, which has a trailhead on CO 77. We saw several other trailheads along the road but I don't remember the names of all the trails. The last leg of our circuit took us past several interesting places where we didn't stop today; there simply wasn't time. At Lake George we turned east on US 24, which is two lanes but fast to Woodland Park. 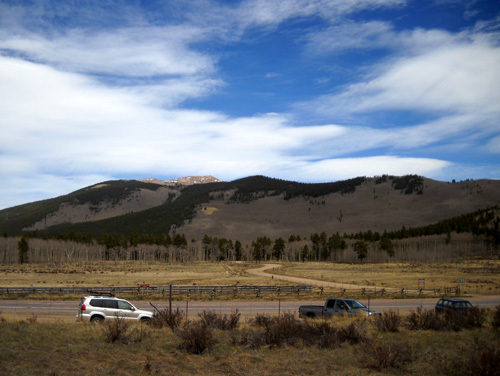 We passed through the little town of Florissant and the road leading to the Florissant Fossil Beds National Monument. 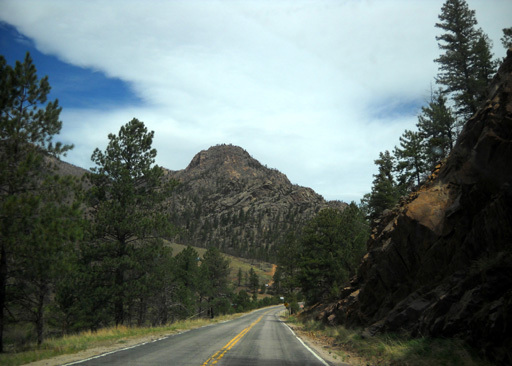 Next was the town of Divide and roads to nearby Mueller State Park and the Colorado Wolf & Wildlife Center. I'd like to go back to some of those when we're in the area again. 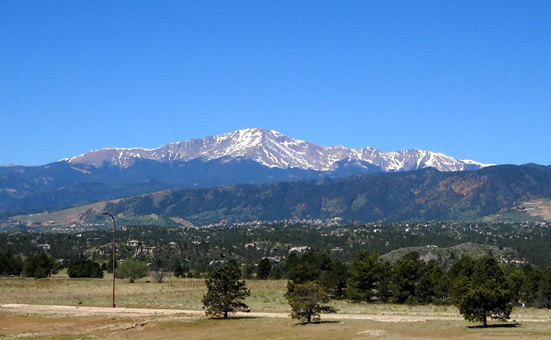 Either hiking to the top of Pike's Peak on the Barr Trail or driving up in our truck is on my list of things to do while we're here this time. I love that mountain. We arrived back at the USAF Academy about suppertime. After all the beautiful scenery and fairly remote roads we'd just driven, rush hour traffic on I-25 was a bit of a shock! It just made us appreciate where we'd been in the Pike National Forest all that much more.